Franklin Levinson has been a professional horseman for nearly 50 years. At 13 years of age he was the youngest registered polo player in the US. In his early 20’s he created and ran equestrian programs at large summer camps in North Michigan. He has always taught success with horses to be a life enriching process for both horse and human and that horses are never naughty or bad. In his teaching he states; “All unwanted behaviour from a horse is a symptom of the animal’s fear and never deserves punishment.” He is adamant about human’s not merely ‘using’ horses for selfish enjoyment. Franklin’s goal that the horse and human become partners through the inspired and excellent leadership of the human. Additionally, his desire is that the horse be honoured and highly respected within any horse – human activity. Franklin was an outfitter and wilderness guide at his ranch on the island of Maui for 30 years (Adventures on Horseback), along the way creating The Maui Horse Whisperer experience. This was the first Equine Facilitated Learning program in the Pacific basin and one of the first in the US. He is credited in Your Horse Magazine 2004, UK’s premier equine magazine, as being the first person to introduce EFL for children with a learning disability to the UK. Additionally, about that same time, he is credited as the first person to bring EFL to Australia. He founded the Australia Equine Facilitated Learning Pty. Ltd. (AEFL) several years ago. With his Training through Trust DVD, filmed in 2005, he created the first video documentation of EFL for children with learning disabilities. For many years before the Natural Horsemanship bandwagon and craze he taught his brand of gentle, effective horsemanship (Beyond Natural Horsemanship, Successful Training through Compassion, Wisdom, Skill and Trust) and EFL in seven countries annually. For over 25 years Franklin has been published internationally in various print media outlets. Other media credits include: podcasts, webinars and numerous television and radio appearances, on the topics of horse training, horsemanship and Equine Facilitated Learning. He even acted in a western movie titled September Dawn starring Jon Voight. He has recently released his first book, an eBook titled Trust ‘n’ Horses Volume 1 and now Trust ‘n’ Horses Volume 2. It is available, along with numerous DVDs, through his website. Franklin Levinson has been working with horses most of his life. He rejects most traditional forms of training which usually consist of ‘breaking in’ an animal with forceful methods. He’s in Ballarat giving demonstrations of natural horsemanship at the National Polo Crosse Championships. It is easy to host one of Franklin seminars in your home area. What is required is a comfortable facility that will accommodate a minimum of 8- 10 pairs of horses and humans. A maximum number of participants are basically decided by the capacity of the hosting facility. Demonstration programs for extremely large crowds are available, such as those Franklin often presents in Greece. Depending on the local climate, a covered arena may be advisable. Topics covered can be requested by the hosting facility depending on the needs and desires of their clientele. Subjects ranging from entry level horsemanship, high level ‘winning’ techniques and training methods for horses and humans, problem solving (all types big and small), centered balanced riding and colt starting are available to name just some of the potential topics. EFL (Equine Facilitated Learning) programs that teach potential practioners, establish Horse Whisperer Seminar bases, as well as providing programs for corporations (leadership/teambuilding) as well as individuals with special challenges are available. Clinics and seminar time frames range from one day to several weeks. Fees vary accordingly. This is why most fees are decided upon on an individual program basis. There are profit sharing alternatives and other opportunities for the hosting facility as well. We hope this information may help and inspire you to want to host a Franklin Levinson seminar in your home area. 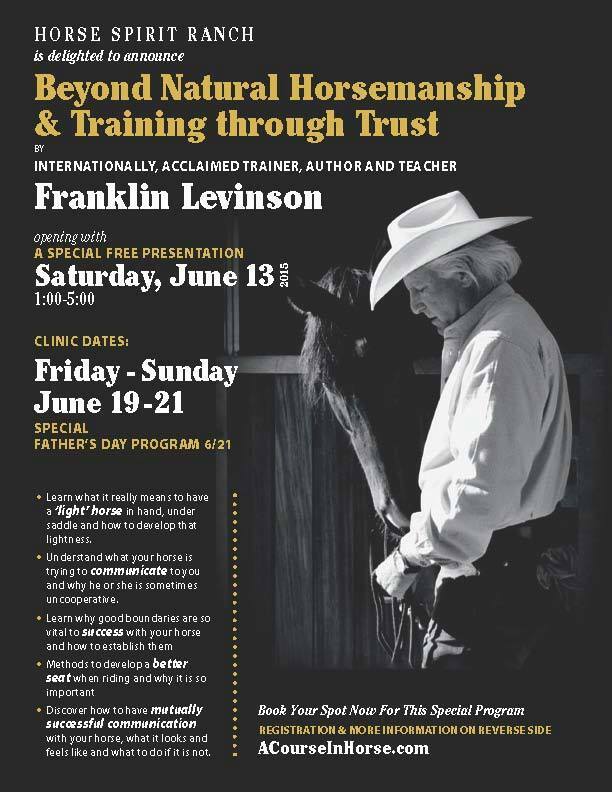 If you know of anyone in your family or friends who would like this fantastic “Beyond Natural Horsemanship clinic” at the Horse Spirit Ranch in California this is for them. Follow Franklin on Horse Whisperer Seminars, Ltd. I would highly recommend it. You are currently browsing the Lifestyle Online blog archives for August, 2014.